This may take a while to explain. Roscommon surrendered a 14-point half-time lead. Yet there were a litany of reasons to be optimistic about the future of the game in the county following Friday evening’s topsy-turvy encounter against neighbours Leitrim in Ballyleague. Confused yet? 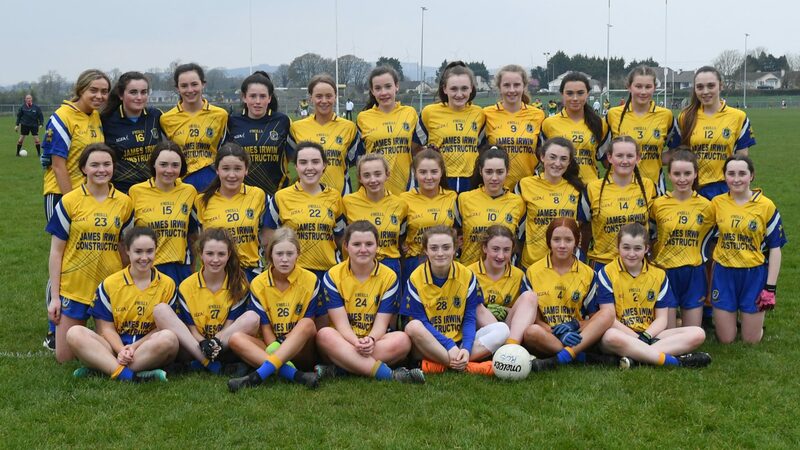 When the sides met in Cloone two years ago at U-14 level, Leitrim were 4-9 to 0-0 ahead inside ten minutes, going on to win by a cricket score on their way to winning the All-Ireland B championship. So while Leitrim staged an amazing recovery at the home of St. Faithleach’s GAA Club on Friday evening, as often happens in games of this nature, the benefits of Roscommon’s relatively newly-formed development panel structures were plain to be seen. Ten of last Friday’s panel, including eight starters, were members of last season’s U-15 development panel. It’s clear that a structured pathway towards the county’s flagship ladies’ team can yield a handsome dividend in the coming years. But lessons will be absorbed along the way. So while there will be initially a feeling of deflation that Roscommon were reeled in so ruthlessly in the second half here, there should also be comfort in the knowledge that a group of players that hardly raised a gallop only a couple of years ago have made significant strides since then. There was plenty in their opening half display to suggest that Roscommon has every reason to be optimistic about its future. As was the case against Sligo a week earlier, Roscommon’s inability to baton down the hatches after building up a significant lead proved to be their undoing. They managed to hold on for a famous victory to land the provincial B championship against the Yeats County. But Sligo didn’t have a player like Muireann Devaney —the Leitrim full-forward running riot in the second half when she was furnished with the type of possession she craved. Yet the Glencar Manor attacker, like her team-mates, remained on the periphery during a devastating scoring salvo from the hosts in the opening quarter. When centre-back Mia Macken burst forward to land a fine score in the 16th minute, Brendan Cregg’s side were 3-6 to 0-1 ahead. Roscommon were playing champagne football, displaying great tenacity in the tackle and always supporting the player in possession. Up front, Shannon McGuinness, Lisa Burke and Aisling Feely were causing all sorts of problems for the visitors, as early goals from the hard-working Abby Curran, Hannah Moylan and Feely left their side very much in the ascendency. Further back the field, Isabelle King, Jane Carty and Mia Macken fought for everything as if their very existence on this earth depended on it, while goalkeeper Lily Vickers made a spectacular save and got great length and direction into her kickouts, albeit there was a stiff breeze at the Éire Óg girl’s back. But the scoring ratio dropped dramatically in the second quarter as Roscommon snatched at chances that came their way. Saoirse Timon also missed a chance to grab a fourth goal, and those misses just about kept Leitrim on life support. Trailing by 3-7 to 0-2, it was Leitrim’s turn to be energised after the break. They pinned Roscommon back, and early points from impressive substitute Celine Shortt, Devaney (a free) and Amy Fowley hinted at the dominance lurking. When captain from two years ago, Siomha Quinn, set up Devaney for Leitrim’s opening goal in the 36th minute, the floodgates opened. Fowley soon raised another green flag, and suddenly Roscommon looked very vulnerable. Having flooded their defence, the focal point in attack during the opening 30 minutes was absent and, under pressure, possession was handed back to the opposition far too easily. Devaney continued to hurt Roscommon on the scoreboard with another couple of goals in the 42nd and 49th minutes. Despite frees from Feely and Curran, Roscommon were eventually pegged back, and three points between the 52nd and 55th minutes from Devaney (2) and Shortt left Leitrim three points clear. Timon was harshly sent to the sin bin to compound matters for Roscommon, and when Devaney pounced for her side’s fifth goal with three minutes remaining, Leitrim’s astounding recovery was complete. Feely did pounce for a stunning late goal to adorn a fine individual display but there would be no chance to secure a share of the spoils. Upcoming games against Mayo and Galway will further this squad’s education before they can justifiably challenge for All-Ireland B honours later in the summer. The important thing is that their upward curve continues. LEITRIM: N. McDonagh; R. Kane, M. Clancy, L. Smith; M. McGrenaghan, N. Morahan, R. Reynolds; O. Moore, R. McKeon; M. Devaney (4-5, two frees), S. Quinn (0-1), E. McGloin; A. Hazlett, S. Ward, A. Fowley (1-1). Subs used: M. Murphy for McGrenaghan (15 mins), C. Shortt (0-2) for McGloin (26 mins), N. Reynolds for McKeon (60 mins). ROSCOMMON: L. Vickers; A. Leonard, I. King, J. Carty; H. Harkins, M. Macken (0-1), C. Powell; A. Curran (1-1, one free), H. Moylan (1-1); E. Thompson, A. Flanagan, S. McGuinness (0-2); S. Timon, A. Feely (2-4, one free), L. Burke. Subs used: K. Leonard for Harkins (half-time), H. Harkins for Flanagan (35 mins), N. Fitzgerald for Burke (40 mins), C. O’Neill for Moylan (46 mins), A. Phelan for Harkins (59 mins). Wides: Leitrim – 8; Roscommon – 10. Yellow Cards: Leitrim – none; Roscommon – Timon (51 mins). Player of the Match: Muireann Devaney (Leitrim). Devaney’s potency in front of goal would have been well-flagged beforehand but the Glencar Manor ace was riddled with frustration in the opening half, opting to go short from a number of scoreable free in the belief that the game was rapidly slipping away from her side. But she was simply unstoppable after the break when restored to her preferred full-forward position. She ran riot, hitting 4-4 to bring her side back from the brink of a shock defeat. Number 13 Anna Hazlett was far more influential when she filled the centre-back berth in the second half. Olwyn Moore, Riona McKeon, Amy Fowley and substitute Celine Shortt also made significant impressions for the winners. Roscommon were superb in the opening half, led by goalkeeper Lily Vickers, Isabelle King, Jane Carty, Mia Macken, Abby Curran, Hannah Moylan, Shannon McGuinness, Aisling Feely and Lisa Burke.